Forget sweatpants, this is the comfort-style hybrid. 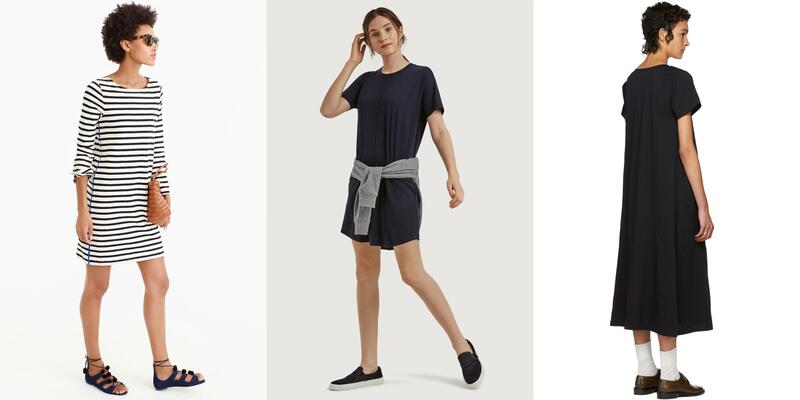 From the street to the gym, the t-shirt dress is an effortless-yet-stylish everyday piece. Subtle detailing upgrades the simple silhouette, making it perfect as a cover-up or worn on its own. Here, six versions to add to your wardrobe. This pullover-style dress is perfect for running around the city. Add a pair of black mules or simple white sneakers to complete a casually chic look. The V-shaped ruching shows off a toned back. Wear with Converse or wedges for a day-to-evening outfit. With a loose fit, this item can be worn as either a shift or an oversized t-shirt. Add a hoodie to create a trendy athleisure look. This panelled cotton jersey dress features a detachable self-tie cinch belt for adjustable definition. A soft cotton-blend fabric provides a nonrestrictive feel, making this the perfect garment for both lazy and active days. This maritime style is great with a pair of kicks in the city or gladiators for days at the beach.